This wine has been consistently well-reviewed by wine critics for both for its quality and price – so we thought we’d add our two penn’orth. Richard and I bought a bottle each and tasted them separately, posting two blogs on the same page. There was no collusion or fore-knowledge of our opinions. Geoff; Colour was bright, clear, lightish red with a slight pink rim. Some viscosity was evident. The nose was vey perfumed and smelt of sweet red fruits, like a summer berry cocktail. Dominant smell was that of strawberries. Acidity was present. The palate was dry after the initial attractive sweetness, not particularly long but it had a good weight in the mouth. The acidity, particularly after chilling, was obvious and gave it a structure. I think the fruit was more loganberry than anything else but you could choose any red fruit and be right. Overall, it wasn’t a complex wine and I disagree that it would beat a Burgundy at the same price. I wouldn’t buy a Burgundy at 8.99 and expect it to compete. It’s a different wine. This German wine is a crowd pleaser, slightly sweet and very distinctively perfumed – I wouldn’t want my red Burgundy to have those characteristics. Okay, unchallenging and made for its market is my summary. [Richard: I saw a good review of this and forwarded the link to Geoff as he often buys from M&S. I never bother looking as too often in the past recommended wines have not been stocked in our local branch. However on the way to Under Pressure, the best coffee shop in Sutton Coldfield, we called in to M&S and there it was, £10 reduced to £8. Bringing booze back from your holiday in the sun is a fine old British tradition, much curtailed post 9/11. My Dad always put a couple of bottles of gin in his suitcase, wrapped in beach towels and never had a breakage but I’ve seen (and smelt) too much spilt wine in baggage reclaim to risk it. So, ‘duty free’ or nothing, with prices no different to what you see in local shops. Kefalonia has a small airport, albeit with large queues, and a modest duty free to match. 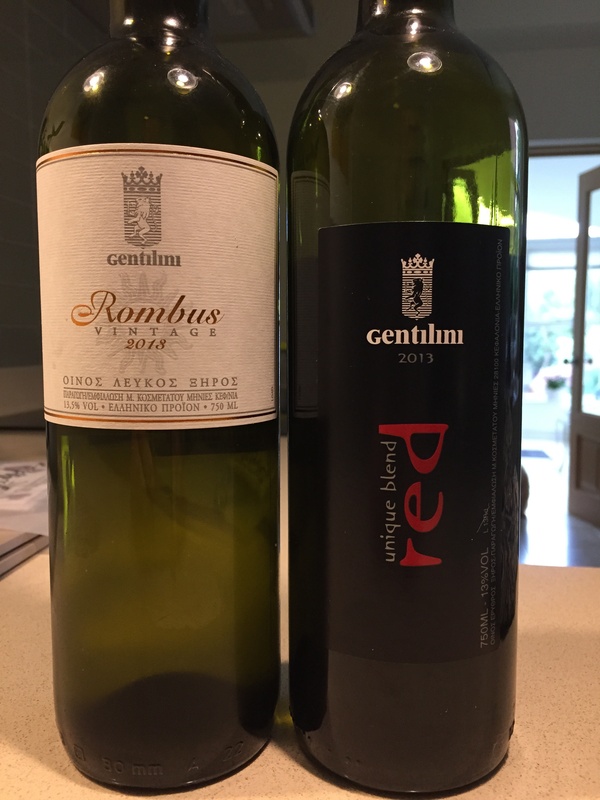 Looking for local wines I went for the above, by Gentilini, not previously seen in Katelios, out holiday village. About €13 each, the most expensive to be had. It turns out the vineyard is near the airport and we must have driven past it in the coach but I didn’t see it. The white – now called Robola, after the grape, was the better of the two. (Previously the appellation did not allow screw tops so in 2013 the name Rombus was used). Very pale green, clear bright, medium viscosity, fresh, aromatic, chalky undertone, rather riesling like. A full mouth feel, some forward sweetness and minerality. Very nice, if too expensive. The red, called ‘Red’ is a blend of agiorgitiko, mavrodaphne and syrah in a 60/20/20 ratio. You might think that this would add complexity but what results is an anonymous wine with little varietal character. Closed nose, purple, too much tannin, some fruit. Ordinary and overpriced, probably the least interesting red tried on the holiday. Tasting this blind, I firmly stated that the dominant grape was Grenache (I got the geography roughly correct); it was powerful and not particularly delicate. The colour was a opaque black, red-rimmed and suggested a fully mature wine. The nose was more interesting, strawberry fruit with some vegetal tones pushing about underneath and even some menthol whiffs coming through. There was also evidence of oak-ageing. The palate was firm with tannins and concentrated with a very slight pepper quality (ooooh – could there be some Syrah in there?). Not a lot – if any at all, I said. Richard tried to lead me away, tried to get me to commit (it’s a fun game of bluff and double-bluff). I smelt a rat (not in the wine). The finish was dry. It was, in fact, 100% Syrah and made in Cornas which is one of the smaller ACs in the north Rhone. The wines from the area do not get a good press – too rustic/variable/unsophisticate/powerful/ etc etc – but this wasn’t too bad. 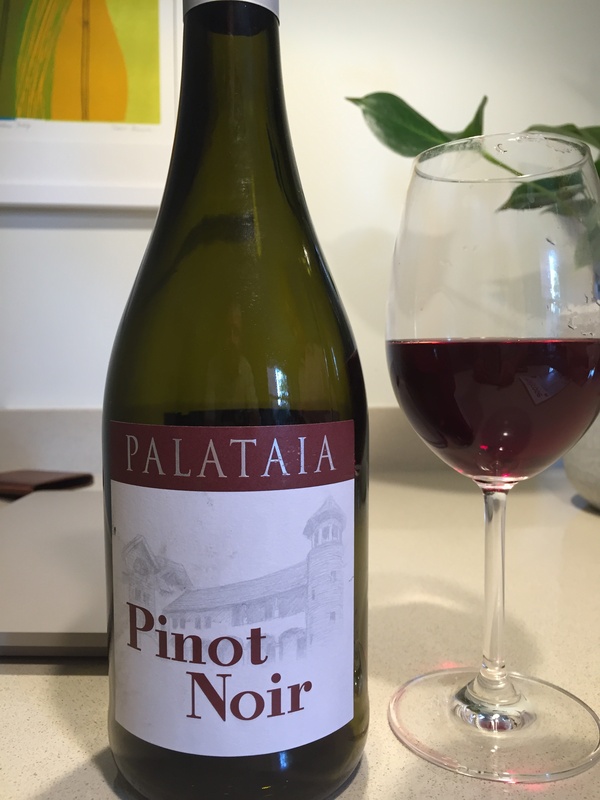 It needed food and possibly still more ageing, but it wasn’t going to achieve the leaner style of Syrah that manifests in its neighbours to the north. 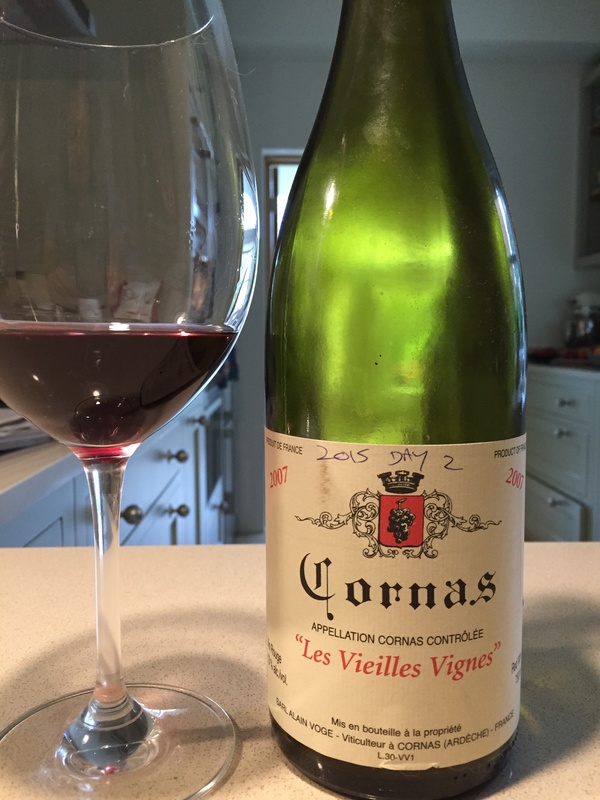 Wine: Cornas 2007 Les Vieilles Vignes by Voge. You feel as though you should genuflect before this wine – the apogee of an Alsace Riesling. 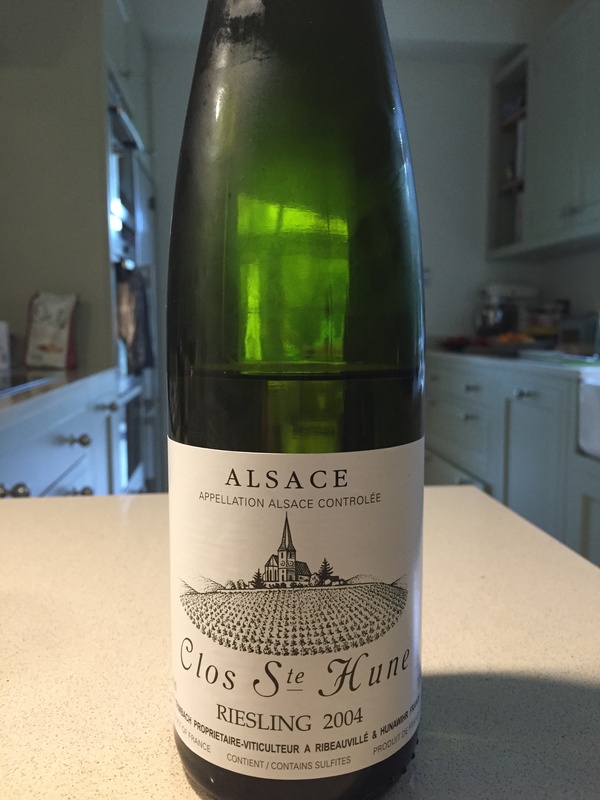 Trimbach’s Clos Sainte Hune limestone-based vineyard has been in the family for 200 years and produces an average of 8000 bottles a year. Needless to say it is much-prized. It’s released five years after the vintage and will keep for 15-20 years; I’m glad we didn’t wait until we are in our 80s, despite my comment below. The deep lemon colour was very bright, clear with little evidence of viscosity – which was surprising when later experiencing the weight in the mouth. The immediate bouquet was that of citrus, lemons rather than limes with only a slight hallmark petrol smell, which might suggest it had plenty of maturing still to do. The honey notes started to increase the longer it was exposed in the glass. The palate was very long and dry but the abiding sensations were those of freshness and a recognition of its power. The recommended drinking window of 2019-2024 could be easily understood however the wine was still very much together, structured and firm. Present were all the notes of honey, lemons and a weighty mouth feel which were expected. I hope Richard can keep the others he has (he’ll tell you more) – and that we’re both around to enjoy them. I must confess that I am not a great fan of Sauvignon – possibly because there is a lot of very obvious styles of that grape about at the moment. My palate finds that, after the big hit of acidity and grassy flavours, there is little left – until you get the next mouthful, of course. There is also the difficulty of matching foods as the wine can dominate to such an extent that you’re left with the rather limiting suggestion of “…and it’s wonderful with goats’ cheese”. If I’m pushed to make a Sauvignon choice it would be for the more subtle flavours of the French rather than the New World styles but, even so, Sancerre can often disappoint. 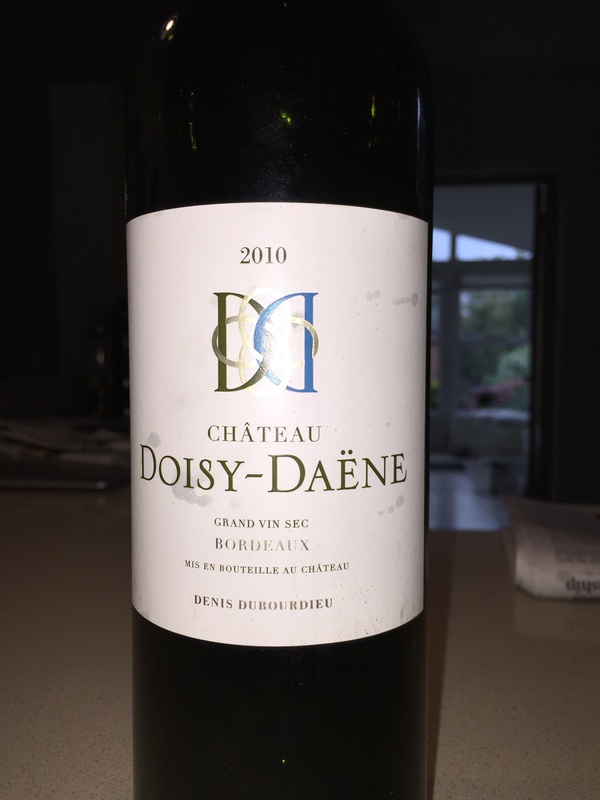 Therefore, after all that negative comment, it was nice to try, on Thursday, a 100% Sauvignon wine that was excellent – Chateau Doisy Daene Grand Vin Sec 2010, made by Denis Dubourdieu. The vineyards are in Barsac, an area of Bordeaux more famous for its sweet white wine; the chateau’s sweet wine is ranked as a 2nd great growth in the 1855 classification. This wine had the wonderful vibrant quality that is expected but a depth and subtlety of flavours that proclaimed its maturing in oak in addition to stainless steel. We had to verify that here was no Semillon in the blend, such was the balance of freshness and muskiness that made it so attractive. Attractive to look at – clear, light lemon yellow and rich, almost but not quite, honeyed on the nose – this was a great accompaniment to the morning’s oysters and yet was still beautiful the following lunchtime. Excellent, but the WS no longer stock it. Pity. St. Aubin is an AC which covers two villages – Gamay and St Aubin itself – lying roughly west of Chassagne Montrachet in the Cote de Beaune. Producing mainly white wines, it offers a reasonably priced alternative to its more expensive neighbours, the two Montrachets and Meursault. The wine we tried came from a premier cru vineyard, Les Perrieres which sits on the lower slopes of the hills behind the villages. The soil is limestone-based and stony. The winemaker is Henri Prudhon. Colour: bright lemon yellow and showing some viscosity though not overmuch. The nose had an intriguing smokiness/struck-match aroma with low acidity, suggesting richness rather than a lean palate. What a complex palate, however! Long, dry with the richness showing through and a surprising refreshing acidity that did not manifest on the nose. It struck a beguiling balance of freshness and almost vegetal richness – a wonderful sipping wine, helped by glasses that allowed it to show off. It wore its 14% ABV lightly. 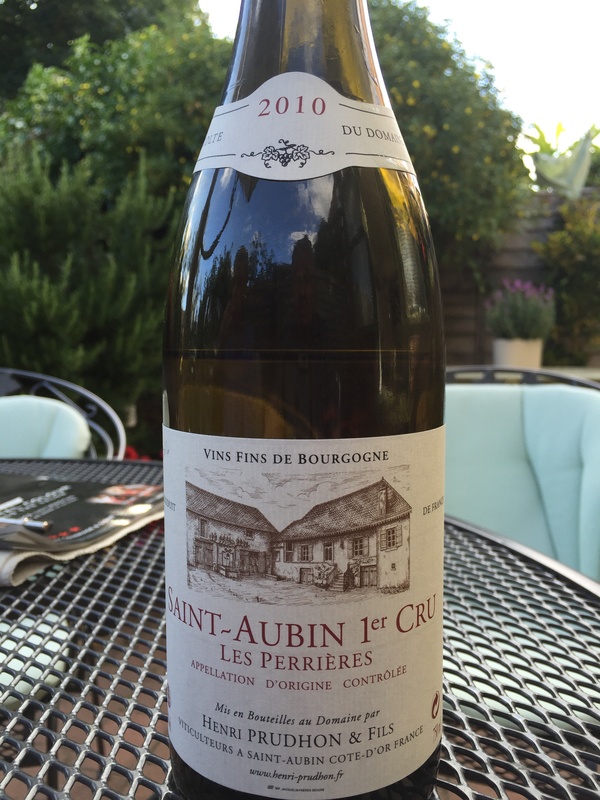 Recap: St Aubin, 1er cru Les Perrieres, Henri Prudhon 2010. I don’t drink much port, sometimes a tawny at Christmas and I can only recall a very few vintage port occasions over the last twenty years. However the first en primeur I ever bought was a Warre 1977, the original ‘votc’ in the last 40 years (see above). Around £60 for a case of 12 bottles. The last was drunk a few years ago but I was never convinced by the quality – good but not great is all. The WS drinking window for this case is a ludicrous 2024-29, with the annoying caveat that you should refer to individual wines for more specific information. This you cannot do as they are no longer listed. So I had a look on Cellartracker and it seemed that the above two were there or thereabouts. [Edit: WS offer document gives 2019-2029 for the GC, 2020-2040 for the SW, which is the opposite of what we felt]. Drunk with some experienced port drinkers and greatly enjoyed. 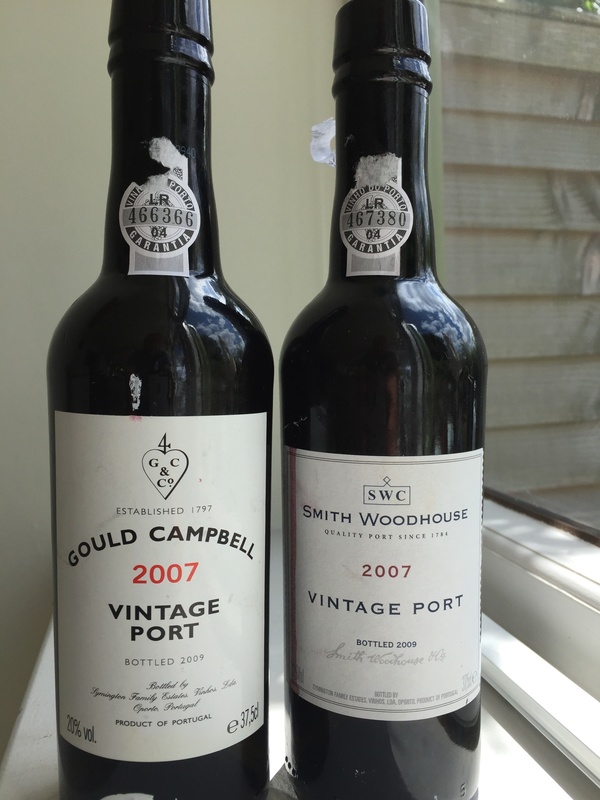 Lots of fruit in both, not spirity, nor complex with the Gould Campbell having more weight. Hard to see they are going to improve much.